The sales pitch for Windows 8 started early on Wednesday night. Intel and Nokia were also showing off their Windows 8 and Windows Phone 8 devices at their own booths. The impromptu tech fair served as prelude to Ballmer’s speech, which is set to kick off around 7:30 pm PT. 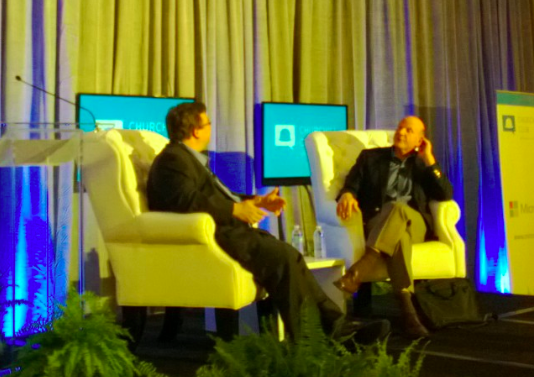 Ballmer is being interviewed onstage by LinkedIn founder Reid Hoffman. Ballmer’s talk comes at a busy time for Microsoft, which last month launched Windows 8, Windows Phone 8 and its Surface tablet. It also comes just days after the company parted ways with Steven Sinofsky. 7:31 pm: We’re being reminded that Ballmer won’t be taking live audience questions, but rather some presubmitted ones. 7:35 pm: And with that, Ballmer and Hoffman take the stage. 7:36 pm: Hoffman starts right off by asking about the departure of Steven Sinofsky. What does this signal? Ballmer indicated there isn’t a big strategy shift coming. “From a strategy perspective, we are all-in on what we’ve done,” Ballmer said. 7:42 pm: On iPad/Mac competition. You need a diversity of form factors and prices. 7:43 pm: Ballmer acknowledges that Microsoft still has some more work to do in the “under five inches” category — a reference to the phone area. Ballmer on competing with its longtime hardware-maker partners. Do I anticipate partners of ours will build the lion’s share of PCs tablets and phones going forward? Ballmer asked rhetorically. So how do you manage that balance? Hoffman asks. “Carefully,” Ballmer said, before expanding some. Ballmer noted that the company handles things a little differently when it comes to Xbox, Windows Phone and the PC side of things. 7:47 pm: Will Microsoft ship a PC? The same holds true on the phone side, he said. Why repeat what others do well? 7:54 pm: On the price of content. It varies by type. Some stuff needs to be paid — James Cameron, NFL. Other stuff can be very low-price or ad-funded. What might be tough, Ballmer said, is stuff in the middle that is too expensive to make free or cheap. 7:55 pm: We know about iOS and Android. “We need to stake out a position through two or three different things. “The ecosystem for Android is a little bit wild,” Ballmer said, pointing to app compatibility and malware issues. With Apple, things are tightly controlled and comparatively expensive. Ballmer paints Microsoft again as somewhere in the middle. “That’s kind of the best of both worlds, and that’s available to us,” he said. Ballmer also said that there is an opportunity with operators, the cellular carriers that still buy a lot of these phones and want three big players. That said, Ballmer notes that the product has to be great. 7:58 pm: Hardware is also changing a lot, he said, noting Samsung’s work in flexible displays. If anyone thinks hardware innovation in pocket devices is ending, they are nuts, Ballmer said. 8:01 pm: On to cloud computing and business computing. Ballmer saying technology companies are like how relationships are characterized in “Annie Hall” (the Woody Allen flick). “You either move forward or you die,” Ballmer said. 8:10 pm: On communications, Ballmer said its enterprise and consumer products will converge over time. “Lync and Skype will come together,” he said. 8:16 pm: On to the Internet and social networking. There’s been MSN and Bing. What’s your view of how Microsoft plays in the Internet? Hoffman said. Ballmer: Three entries in tech: Devices, enterprise services, consumer services. One of the company’s biggest plays in that last group is the recently acquired Skype. “It is a foundational element,” Ballmer said. Bing is also improving, though a lot of work remains. 8:18 pm: What are key risks in Microsoft’s future? Hoffman said. “The No. 1 thing is, in the things we are not successful, we never get there,” Ballmer said. No. 2 would be dropping the ball in areas where Microsoft is strong, and No. 3 is not recruiting the talent needed to avoid those first two pitfalls. Tech, he said, is an area where you have to reinvent yourselves more often. It’s a little different at Procter & Gamble, Ballmer said — that’s the only other company he worked at. Brownie Mix (the product he worked on) just isn’t the same. 8:20 pm: How do you avoid innovator’s dilemma? Hoffman asks. Ballmer said leadership has to err on the side of cannibalizing. “I’m not saying randomize or change direction every five minutes,” Ballmer said. He points to an early project running IT for Energizer, which eventually led to services like Office 365. 8:27 pm: Moving on to audience Q&A (which are written questions that Hoffman selected). 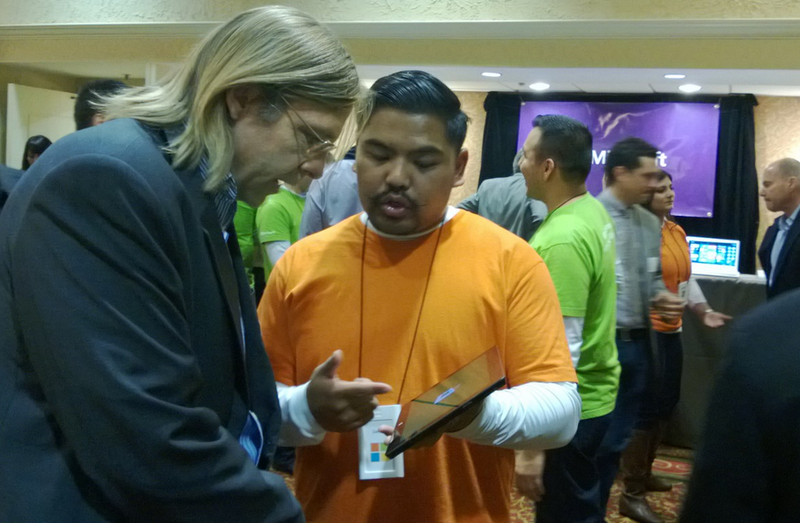 What has been the biggest surprise from business customers in their reaction to Windows 8? “Touch, touch, touch, touch,” Ballmer said excitedly. Another thing is Windows To Go, which lets companies put a Windows 8 image onto a flash drive. 8:29 pm: Are you confident Windows Phone 8 can take a meaningful share of the market, and why? I’m going to go back to the dialogue we had earlier. Strategically, we think there is a place to be the best of organization and the best of diversity, which we don’t think the competition does. Our challenge right now is not getting 60 percent of the smartphone market, Ballmer said. Our challenge is to get 10, then 15 and then 20. 8:31 pm: What do you most pay attention to in Silicon Valley? What are the trends you see? What do you see happening here? Ballmer: We say “Silicon Valley” and there about four Silicon Valleys. There are the companies that build silicon, storage, networking. That still exists and is really important. You wouldn’t believe us, reading the popular press. That’s mostly based in Silicon Valley. There’s consumer stuff, much of which is in San Francisco. He notes that he’s made a number of recent trips to “Silicon Valley,” and never made it past San Francisco, he said. And, of course, there’s Intel, Cisco and guys we compete with, Ballmer said. 8:34 pm: Trends — UI innovation on devices. Microsoft is doing a lot in-house, and also licensed technology for Kinect. Machine learning and Big Data. The thing that is most interesting about Big Data, Ballmer said, is that people will write software differently. 8:38 pm: Why buy Windows 8 if you already have a Windows machine? 8:41 pm: What is the least-understood part of Microsoft’s view of the future? One area that Microsoft has invested more in than any other company, with one exception (I think he means Google): Machine learning. 8:44 pm: And I think that’s a wrap.